Thos. 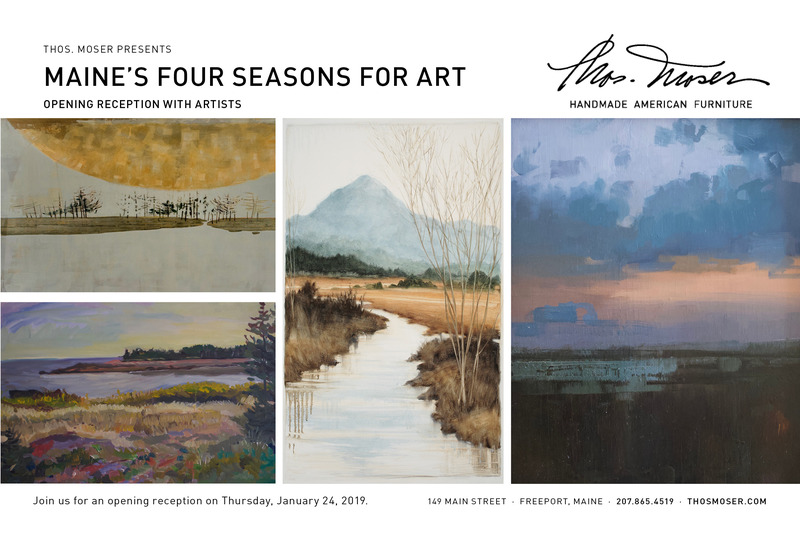 Moser announces its winter art exhibit, Maine’s Four Seasons for Art, on view in the Freeport showroom. As part of the company’s ongoing commitment to showcase Maine art, the exhibit features over 100 paintings from 22 Maine artists. Featuring work by David Little and introducing artists: Kristine Biegel, Richard William Blanchard, Mark Coates, Jerri Finch, Lisa Kyle, David D. Pearce, Lea Peterson, Donald Rainville and Andrea Rouda. Ongoing exhibitors include: Linda Bail, Philip Barter, Andre’ Benoit, Tom Curry, David Estey, Philip Frey, Anne Ireland, James Kucheman, Ann Mohnkern, Don Ripper, Marguerite Robichaux and Judy Taylor.